My name is Lisa Hodge. 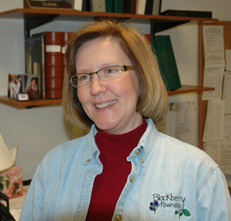 I am currently serving my third term as Blackberry Township Clerk. I was originally elected in 2005. I have been living in Blackberry Township with my family since 1989. My husband and I have two adult children. I have always been active in the community as a volunteer in Scouts, School Helper and Church Volunteer. Serving in local government has been a change in venue for me that is both interesting and rewarding. The Township Clerk’s term of office is four years. The Clerk’s primary duty is to be the keeper of all Township records. These records include records of all Town meetings, Township Board meetings and any executive sessions. The Clerk is the official FOI (Freedom of Information) Officer. Any request under FOI should be addressed in writing to the Clerk by either, a letter, email or fax. The Clerk is the Township’s election authority and is responsible for posting all election notices. The Clerk is also responsible for all official public "Notices" published in the local newspapers. The Clerk posts notices of all official meeting of the township on the outside front door of the Township building located at the address indicated above. The Clerk administers all required Oath of Offices. An additional task expected of the Clerk is the "Open meetings Act Designee." The Clerk is the official custodian of all Cemetery records since the Township has assumed responsibility of the Blackberry Township Cemetery at Keslinger Rd and IL Rt. 47 in Elburn. In addition to the Cemetery records the Clerk has official responsibility for the records kept for the Highway Commissioner. As part of the Clerk’s duties I am required to serve as ex-officio Clerk for the Road District and as a member of the Mental Health Board. The Clerk is required to witness bid openings for both the Township and the Road District. In Blackberry Township, I have assumed the additional responsibility of reconciling all accounts. The Clerk is the primary person responsible for monitoring state laws or regulations that may impact the Township.